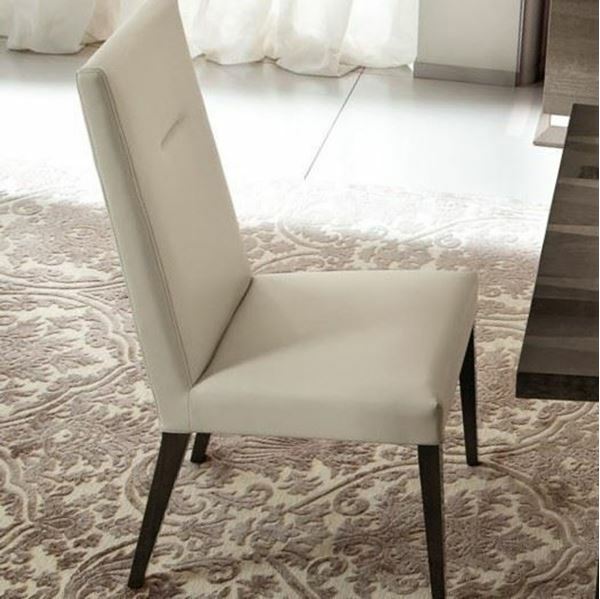 The ALF Monaco Side Chair, part of the Monaco Dining Room Collection by ALF Italia. Italian craftsmanship and artisan creativity is fully expressed in this collection. Velvet Birch is precisely cut then laid at 180 degree angles to each other. The result is a stunning visual effect that you see in the finished surface. The side chairs feature this artisanship on the back, and the front of is upholstered in a warm light grey leather. Condo Size Dining Table 63"W 37"D 30"H. Opens to 83"
Grand Size Dining Table 77"W 42"D 30"H. Opens to 98"
The ALF Monaco Bedroom Collection, by ALF Italia. Italian craftsmanship and artisan creativity is fully expressed in this collection. Velvet Birch is precisely cut then laid at 180 degree angles to each other. The result is a stunning visual effect that you see in the finished surface. The headboard is finished with a warm light grey leather. Drawer pulls are a unique black single twist steel post finished in black nickel. The cases are finished atop a pedestal base with a brushed steel accent reveal. 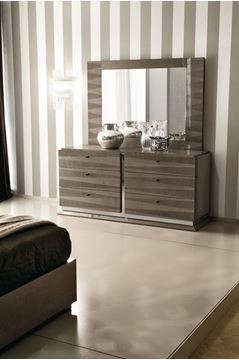 The ALF Monaco Bedroom Dresser, by ALF Italia. The Dresser perfectly demonstrates Italian craftsmanship and artisan creativity. Velvet Birch is precisely cut then laid at 180 degree angles to each other. The result is a stunning visual effect that you see in the finished surface. Drawer pulls are a unique black single twist steel post finished in black nickel. Attention to detail is demonstrated with the addition of soft closing glides in every drawer. The cases are finished atop a pedestal base with a brushed steel accent reveal. 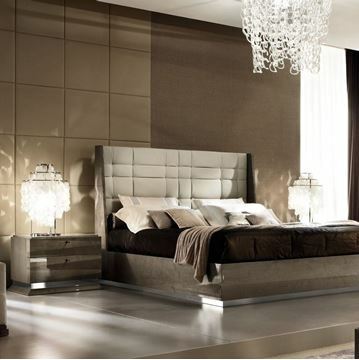 The ALF Monaco Bed, by ALF Italia. Available in King, Queen, and California King bed sizes. Italian craftsmanship and artisan creativity is fully expressed in this collection. Velvet Birch is precisely cut then laid at 180 degree angles to each other. The result is a stunning visual effect that you see in the finished surface. The headboard is finished with a warm light grey leather. Drawer pulls on the nightstands are a unique black single twist steel post finished in black nickel. The cases are finished atop a pedestal base with a brushed steel accent reveal. 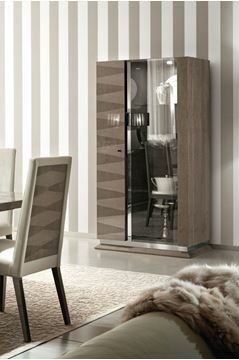 The ALF Monaco Curio Display Cabinet, the two door large size is part of the Monaco Dining Room Collection by ALF Italia. The doors feature soft closing hinges, and the interior is illuminated with a flush mounted LED Light. Available in two sizes, these curio cabinets show well as a free standing piece, or as two, three, or more aligned in a row to create a dramatic wall display. Italian craftsmanship and artisan creativity is fully expressed in this collection. Velvet Birch is precisely cut then laid at 180 degree angles to each other. The result is a stunning visual effect that you see in the finished surface. The cabinetry is finished with a unique pedestal base with a brushed steel accent reveal. 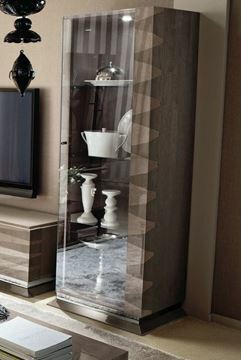 The ALF Monaco Curio Display Cabinet, the one door small size is part of the Monaco Dining Room Collection by ALF Italia. The doors feature soft closing hinges, and the interior is illuminated with a flush mounted LED Light. Available in two sizes, these curio cabinets show well as a free standing piece, or as two, three, or more aligned in a row to create a dramatic wall display. Italian craftsmanship and artisan creativity is fully expressed in this collection. Velvet Birch is precisely cut then laid at 180 degree angles to each other. The result is a stunning visual effect that you see in the finished surface. The cabinetry is finished with a unique pedestal base with a brushed steel accent reveal. 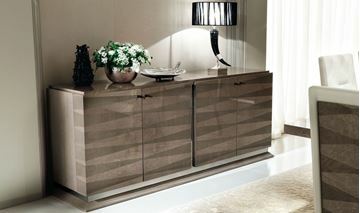 The ALF Monaco Buffet, a part of the Monaco Dining Room Collection, by ALF Italia. Italian craftsmanship and artisan creativity is fully expressed in this collection. Velvet Birch is precisely cut then laid at 180 degree angles to each other. The result is a stunning visual effect that you see in the finished surface. The four door buffet features pulls crafted in a unique single twist steel post finished in black nickel. Doors are soft closing. The buffet is finished atop a pedestal base with a brushed steel accent reveal. The ALF Monaco Dining Room Collection, by ALF Italia. Italian craftsmanship and artisan creativity is fully expressed in this collection. Velvet Birch is precisely cut then laid at 180 degree angles to each other. The result is a stunning visual effect that you see in the finished surface. The leaf is self storing within the dining table. The side chairs feature the same inlay design on the back, and the front of is upholstered in a warm light grey leather. The four door buffet features pulls crafted in a unique single twist steel post finished in black nickel. Doors are soft closing. The buffet and curio are finished atop a pedestal base with a brushed steel accent reveal. 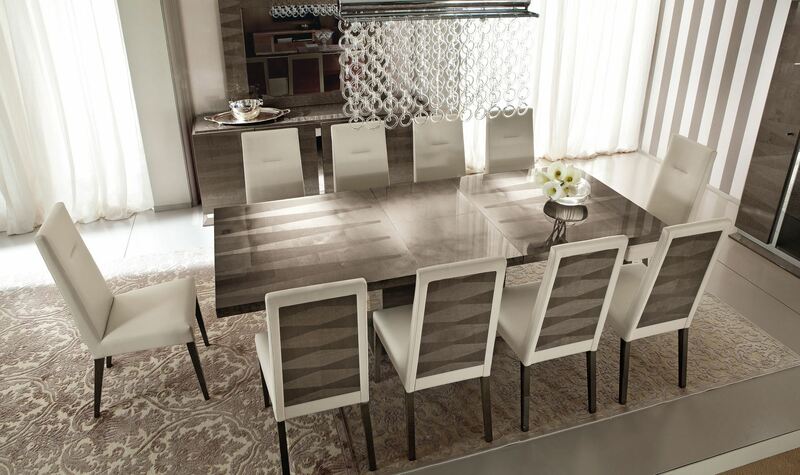 The ALF Monaco Dining Table, part of the Monaco Dining Room Collection by ALF Italia. Two sizes are available. Condo size, 37"x63" opens to 83". Grand size, 42"x77" opens to 98". Italian craftsmanship and artisan creativity is fully expressed in this collection. Velvet Birch is precisely cut then laid at 180 degree angles to each other. The result is a stunning visual effect that you see in the finished surface. The leaf is self storing within the dining table. 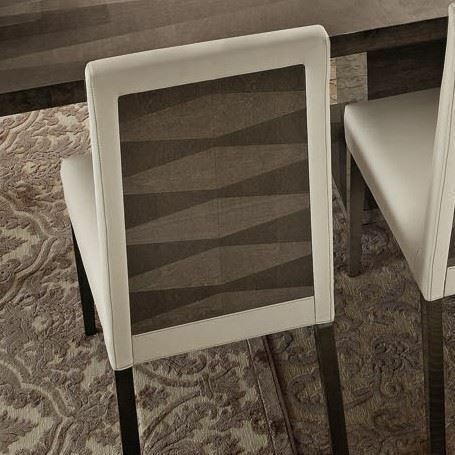 The side chairs feature the same inlay design on the back, and the front of is upholstered in a warm light grey leather. 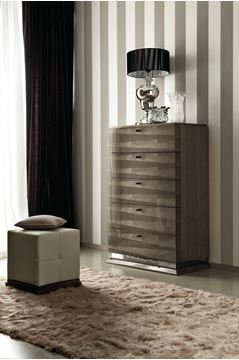 The ALF Monaco Tall Chest of Drawers, part of the Monaco Bedroom Collection by ALF Italia. Italian craftsmanship and artisan creativity is fully expressed in this piece. Velvet Birch is precisely cut then laid at 180 degree angles to each other. The result is a stunning visual effect that you see in the finished surface. Drawer pulls are a unique black single twist steel post finished in black nickel. The cases are finished atop a pedestal base with a brushed steel accent reveal. All drawers feature soft closing drawer glides. 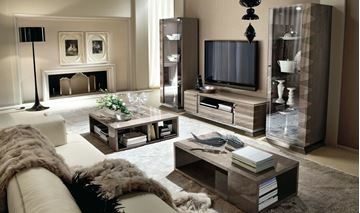 The ALF Monaco TV Media Cabinet, part of the Monaco Entertainment Collection by ALF Italia. The center storage drawers feature soft closing glides. Two additional storage compartments to the left and right of the drawer offer additional storage and organization. The matching glass display cabinets feature soft closing door hinges, and the interior is illuminated with a flush mounted LED Light. Italian craftsmanship and artisan creativity is fully expressed in this collection. Velvet Birch is precisely cut then laid at 180 degree angles to each other. 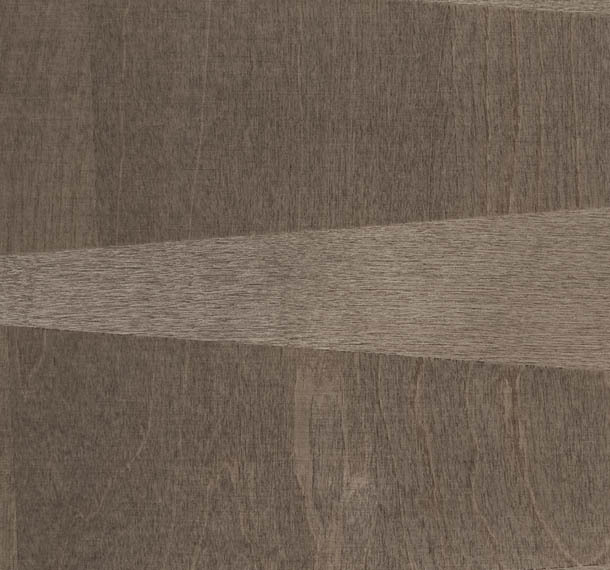 The result is a stunning visual effect that you see in the finished surface. The cabinetry is finished with a unique pedestal base with a brushed steel accent reveal.